There is a beach right in front of Suma station, 10 minutes by train from our closest station. Since it is only 10 minutes on foot from our house to Harbor land where we can see the ocean, we haven’t visited this Suma beach. But the view from the station is enough great as we do a triple take at it. In the middle of the Golden week, one fine day, the view you may see just after the ticket gate of the station is this scene above. The existence of the station with such a lovely view which we can get in 10 minutes makes us feel really great and proud. The beach goes 1.8km, which is very comfortable length to take a easy walking. Although we tend to go somewhere far at the long vacation, we found there might be something more we can encounter even just around us. 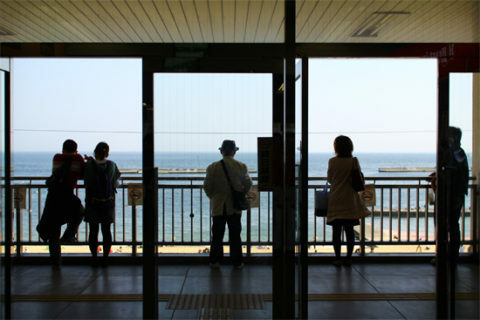 Photo: The exit of Suma station.